Camped on a hilltop overlooking the Pine River in northern Lake County we heard the unmistakable growl of a big motorcycle coming up the sandy 2-track. It was a surprise visit from Feral’s brother-in-law John. Taking a 1000 pound Honda Goldwing trail riding is not a sport many men would attempt but John wrote his own rules. This was before helmet laws came and went. If I remember right he was wearing a cowboy hat right out of a spaghetti western. John came bearing gifts. John was a craftsman. He had made a fish filet knife with a bone handle and a bone sheath. He proposed it belonged to whomever caught the biggest trout on the opening weekend of trout season, the reason for our gathering. It turned out to be a traveling trophy for the group. For the next 15 years whomever caught the biggest trout won the knife for a year and right to carve their initials, and year, in the bone sheath. After 15 years there was very little space to carve anything. I think Feral has the retired knife. Back then, in my early days of guitar, with Feral on mandolin, we would bang out some popular folk songs aka Bob Dylan, CSN&Y, 70’s stuff that was defining our messed up generation. Strangely, John took campfire music to be just that – songs that resonated around campfires a generation before us. Think “Frog went a Courting”. Songs I vaguely remembered from grammar school music class. And it was all fun, particularly if we were knocking down a few cold ones before scaling the big hill down to the river for some night fishing. It’s been about ten years since I saw John last. I got word this winter that he passed away. Cancer got him. 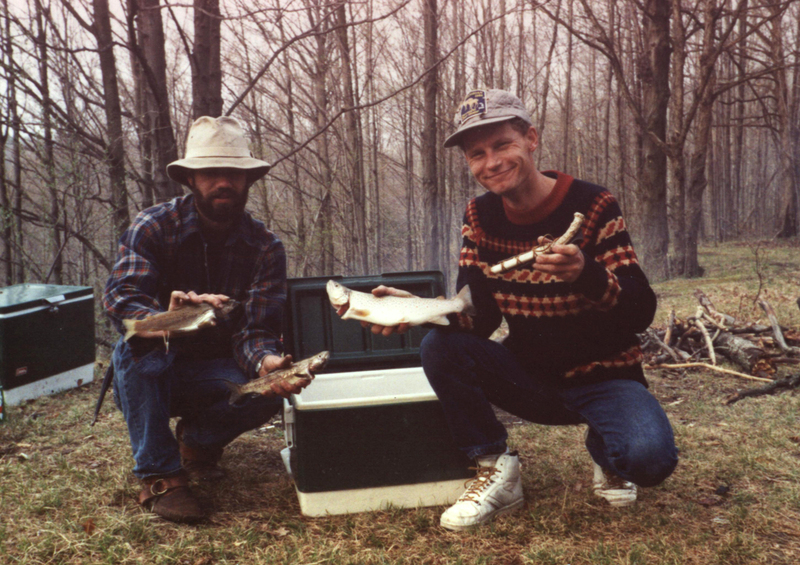 I’ll say this about him – he was a lot of fun back in our early camping days and when he smiled, which was all the time, you couldn’t help but smile right along with him.